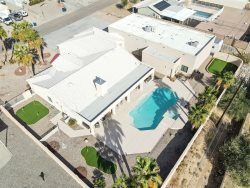 This beautiful condo is located at the Havasu Springs Resort around 20 miles from Lake Havasu City. The condo has breathtaking lake views, private boat slip, BBQ grill/smoker, and an open area kitchen! Enjoy your morning coffee or afternoon cocktail on the balcony, then you can relax at the community pool and spa! Havasu Springs has a great restaurant that delivers; you will only need to leave the condo to enjoy the lake! They were very friendly and nice to work with.